My new favorite thing is nail polish marbling. Have you tried it? The other day I decided to dip a few eggs like I did these glasses – and then proceeded to work my way through two dozen eggs. It makes me seriously wish I had more colors of nail polish! And then I had to take roughly a million pictures. Because aren’t they just the coolest? Eggs. A lot of them. Because once you start you’ll want keep dipping. 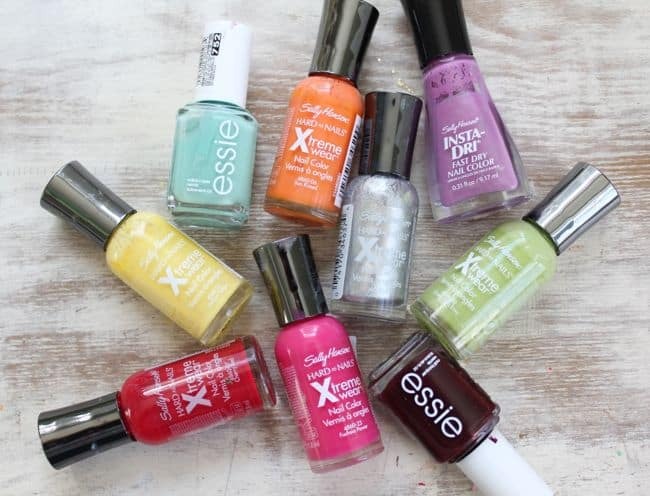 Nail polish in all kinds of fun shades. My Essie polishes worked fine this time, I think because I wasn’t trying to make a specific design. And silver polish was amazing! Nail polish remover. You’ll need this to get the polish off your fingers when you’re done. 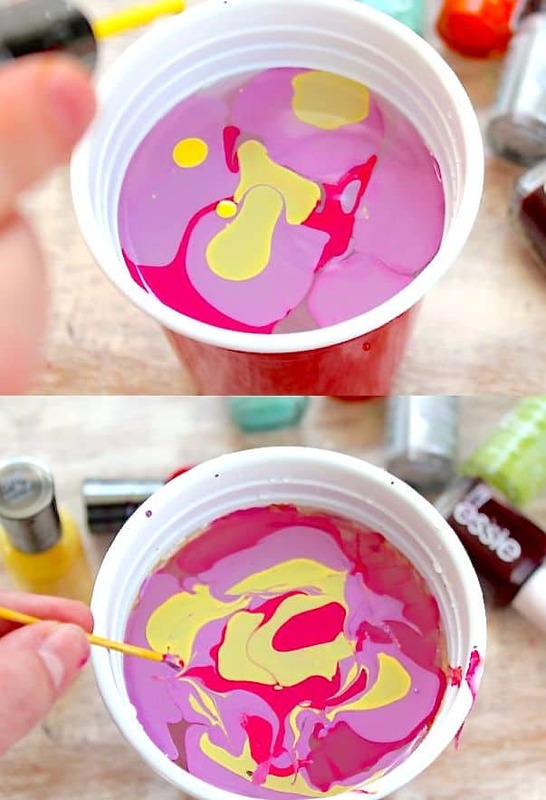 Drop lots of nail polish into the water. If it sinks, the temperature isn’t right. You want it to spread out over the top of the water. Have fun playing with colors! Then take a toothpick and swirl the colors a bit. Hold your egg between your fingers so that you cover the least amount of surface area on the egg. Then dunk straight down into the water, hold for a second underwater and then bring it up. If you use a larger container, then you can roll the egg around under the water and bring it up on the blank side so that you can cover all of the egg with polish. Sit the egg in a carton or something and let it dry. Yes, your fingers will get a bit messy. I tried dunking with skewers or spoons and nothing worked as well as my hands. Have you decorated any eggs for Easter yet? I dyed some with the kids last weekend and it was really hard to share. Love black and white? Check out these minimally marbled eggs with polish. Its really amazing content.By the way the eggs are so beautiful.And I loved the way that you’ve expressed here. I really like this post. You write it very well. So Inspiring, I’m now OMG when I saw the way you did that. I’m at work browsing your blog from my new apple iphone! Just wanted to say I love reading your blog and look forward to all your posts! Carry on the excellent work! Can these eggs be eaten? Unlocker is a software which is used to delete a file in Windows that could not be removed previously. Unlocker software which can delete files or folders that are hard-deleted and can detect the program running the file. The use is easy, with just one click. ESET Smart Security 9 Activation Key 2017 Valid Till 2020. Eset Smart Security License Key, Eset Smart Security 9 Username and Password 2018, Serial, CracK. These nail polishes are extremely gorgeous. Nice . Just use latex gloves! Voila!???? it looks less intimidating than doing it on nails ! Just in time before eastern. My kids will love them. These are absolutely gorgeous, Steph! What an amazing idea…you come up with such lovely stuff. Those are fantastically cool, Very festive and fun! That looks beautiful!!!! I’ve seen that on Pinterest for doing your fingernails, but never thought about it on eggs before! Gorgeous!! thank you for sharing this articles. big celebrate for fifa world cup 2018 russia. Gorgeous! 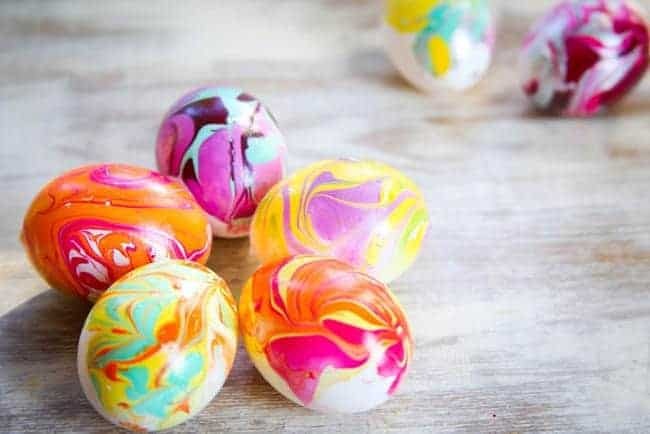 I’m so used to seeing marbling applications in pastels..
Its really amazing content.By the way the eggs are so beautiful.And I loved the way that you’ve expressed here.Please let me know if articles are published by you at [email protected]. Love the result ! And somehow, it looks less intimidating than doing it on nails ! No doubt!! It’s great share @STEPHANIE GERBER. but one thing need to know. This tricks can be more hard egg? I love this technique! 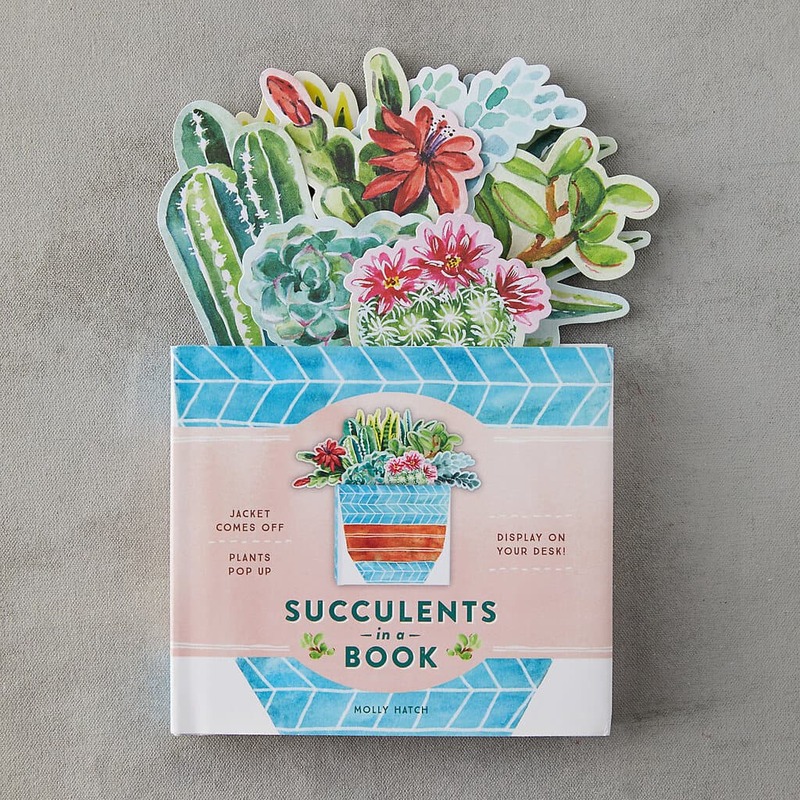 It is a great way to decorate different things that will look so cool and unique. Nice Thanx I would never think to do this! If you want to do this but are concerned about using the nail polish on hard boiled eggs, just do it with hollow egg shells instead. Blow the eggs out, wash the shells, leave them to dry and then scramble the eggs up for breakfast. After breakfast, have fun dipping the shells in nail polish or anything else you want to dip them in. How can I be like that..? 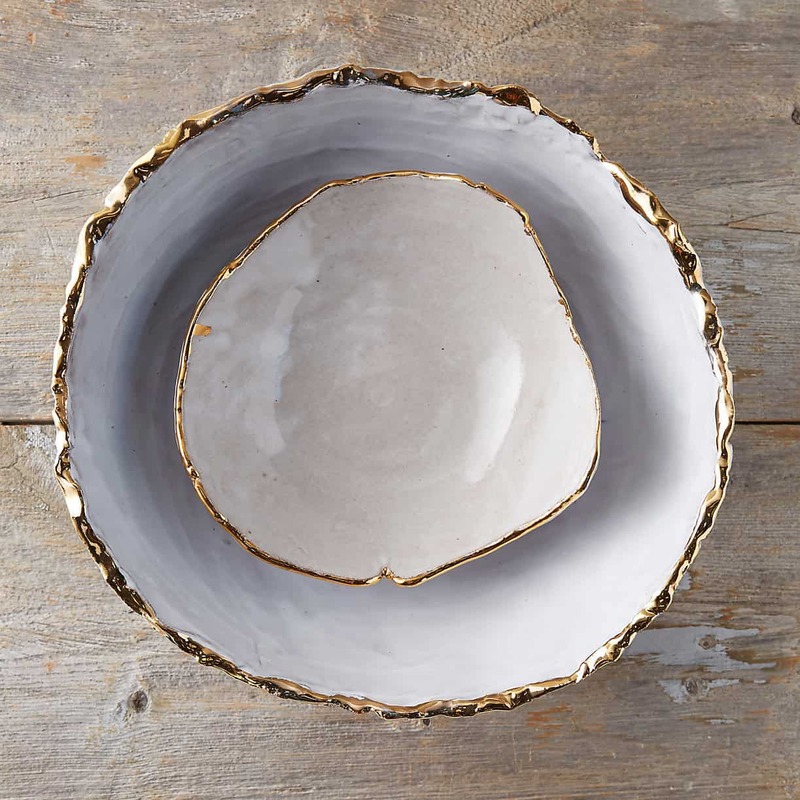 I think the only way to decorate with nail polish is on an empty (blown) eggshell. visit the site, that’s what this web page is providing. Amazing fashion tips. Will be visiting most often here. DO NOT EAT THEM!! We tried this with a few of our eggs. They certainly did not look like the pictures above. but when we went to peel them the next day they REEKED!. The chemical reaction with the inside of the egg was pretty unpleasant. (Like very, VERY rotten onions and eggs!) I think the only way to decorate with nail polish is on an empty (blown) eggshell. Eat,Don’t do it nail polish is poison,that’s why food colors are used. Should be wearing gloves,of latex if not allergic,line bowls disposable ones in waxed paper you’ve greased. Our Daughter and Grand did this Glorious Easter morn,they are off to the hardware store for Acetone,1 bottle fingernail polish won’t get it. Are you using hard boiled eggs? Can you eat them after? I couldn’t get the technique right. Mine looks lumpy and terrible. Would the wire holder that comes in Easter egg coloring kits work for holding the eggs while dipping them ? I have tried that and the egg slips around too much. A wider bowl definitely helps with the mess factor though! Egg shells are permeable, so I wouldn’t want to eat a hard boiled egg that was colored with nail polish. They’re pretty for blown out eggs, though. BEWARE! Tried this. Eggs turned out ok, but after storing in frig, the smell contaminated everything! Still trying to get smell and taste of polish out of foods. Had to toss perfectly good fruits, veggies and meat. Even wrapped food tastes like chemical after weeks. May be pretty but definitely not safe or practical from a chemical perspective. Are the eggs edible with the nail polish on the shell?? I would not want to chance getting sick from eating them just in case some of the chemicals from nail polish leaches into the inside of the egg shell. You can blow the eggs and decorate the shells. With care they last forever and some even make nice christmas tree ornaments. After dipping, spray with a sealant glaze. Thought it might work well with pollystarine (?spelling) eggs. Stick a cocktail stick in one end then dip in solution. Take out then use other end of stick to stand it in flower foam to dry. These would look nice in a bowl and could be brought out each year. Or pin a ribbon in to hang on twigs. So your saying not to worry about the poisons that WILL seep through? Dibutyl phthalate, toluene, and formaldehyde. If they seep though your fingernails, it WILL seep through an egg that has millions of tiny holes so the baby chick don’t die. I think if you colored the eggs first with the normal egg coloring it then did the nail polish dip you would have the whole egg colored. I understand that if you use petroleum jelly (vaseline) on your fingers, the nail polish comes off without remover. Haven’t tried it, just read it. My nieces are gonna love this one! This will be the first Easter I get to spend with them, and there’s nothing they love more than painting their fingernails right now. They’re gonna love it! I’m not sure if they can eat these eggs afterwards .. .so we’ll probably do a few just for fun. Thanks! These eggs are absolutely original!! Thank you for your tips! haha! these are great! We have an annual Easter egg bashing fight at work…these would be stronger than the plain old dyed eggs! Might actually win the fight! You’ve got to be kidding me! This is brilliant! I want to to do everything in swirl nail polish. So, I tried. And I failed miserbly! I don’t think that’s a craft fail! They look pretty cool to me! They look super cool. I’m gunna try today. Oh, these are absolutely gorgeous, Steph! What an amazing idea…you come up with such lovely stuff. These are beautiful! Love how vibrant the colors are! I worked with hollow eggs btw and they work fine if you can stick them onto something, easier to dry them anyway. The eggs didn’t smell the nail polish did. The smell of the nail polish is absolutely horrid and lingers for hours! Wow, that is very cool – love your eggs!! 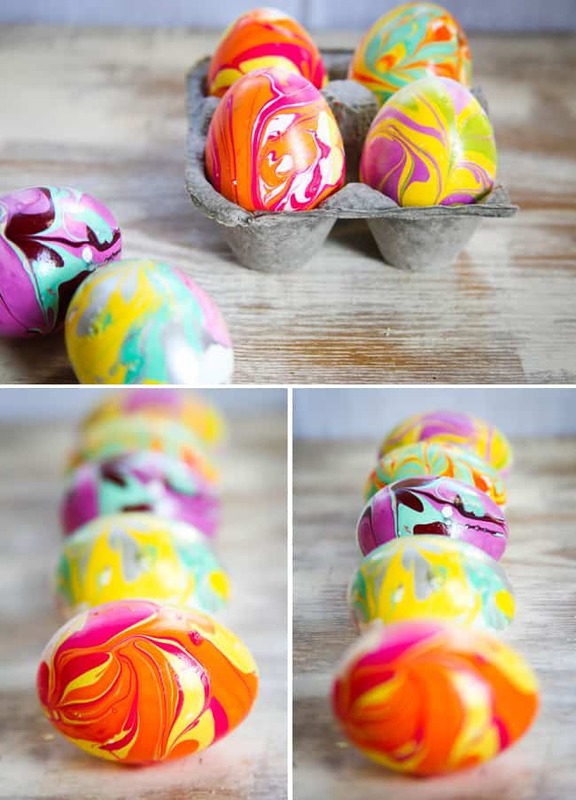 I’ve got this linked to my Easter eggs DIY post too today, thanks for posting your tutorial! Mine look crappy just out of the water too! 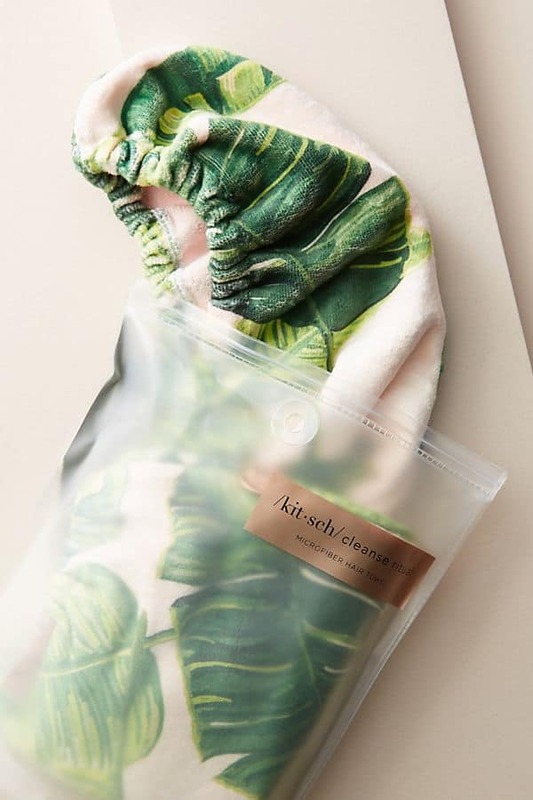 (see the pic above) How do they look after they have a chance to dry? Messy project. Keep area well ventilated because of he fumes. It’s difficult to cover all sides of the egg. Worked well on plastic eggs, strung on fishing line (allowed for smudge free drying and dipping) and coverage of the egg. & why not use a wire dipper like the 1s that come w/ egg dyeing kits? I’m old enough to remember when you could buy egg marbling kits that used lacquer paints similar to nail polish. We placed the dipped eggs on waxed paper to dry. We ate the eggs too – not sure if that did us any good, tho….. I remember those kits too. The dyes came in glass bottles with bunny heads for the tops. I’ve been looking for that type for years!!! Ruby’s Easter egg dye. They stopped making it. i wanna try this with some beads! Great idea, my daughter does her nails like this all the time. Why not try it on plastic eggs too? Put a string through the end first, dip and hang it to dry. ********* You certainly wouldnt want to eat the egg after doing this. Love the results we are going to give this a try when we do eggs next wk thanks! First, please don’t get me wrong, these eggs are very lovely. But I think it’s definitely important to note that nail polish usually contains several seriously dangerous toxins, and egg shells are porous, so you really wouldn’t want to eat them after they’ve been dipped in nail polish. Oh man, or taping off the tip of little girls Easter shoes an marbleizing the the tips of the shoes! I hope that made sense. Then you could paint polka dots or little eggs over the rest of the shoes. My mind is spinning! Thank you so much for this inspiration. They are gorgeous! 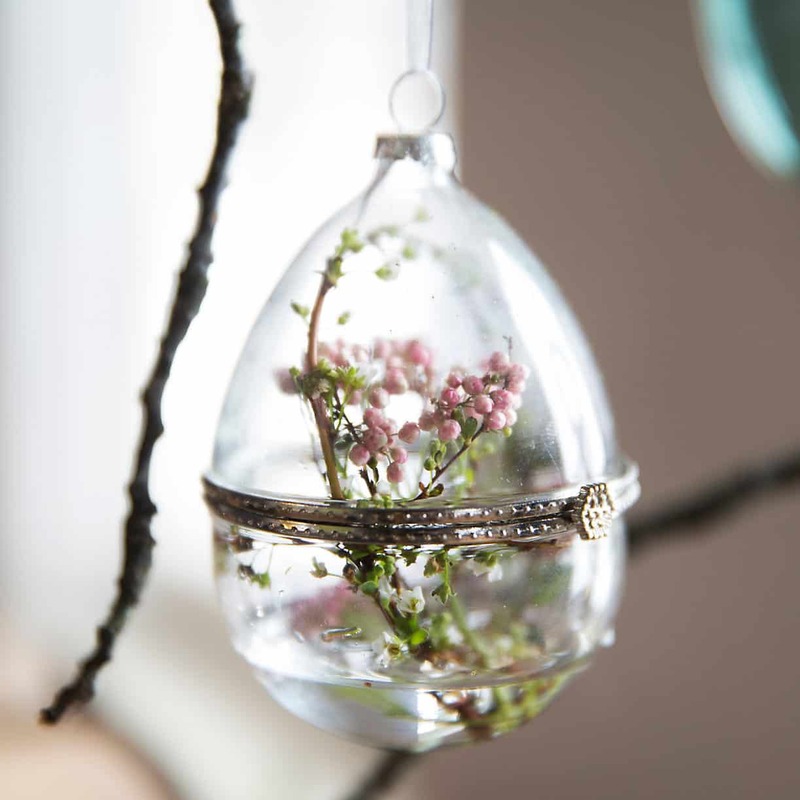 Think about using big jewelry beads ands stringing them up into festive spring jewelry! This is so cool! I love how vivid all the colors are! 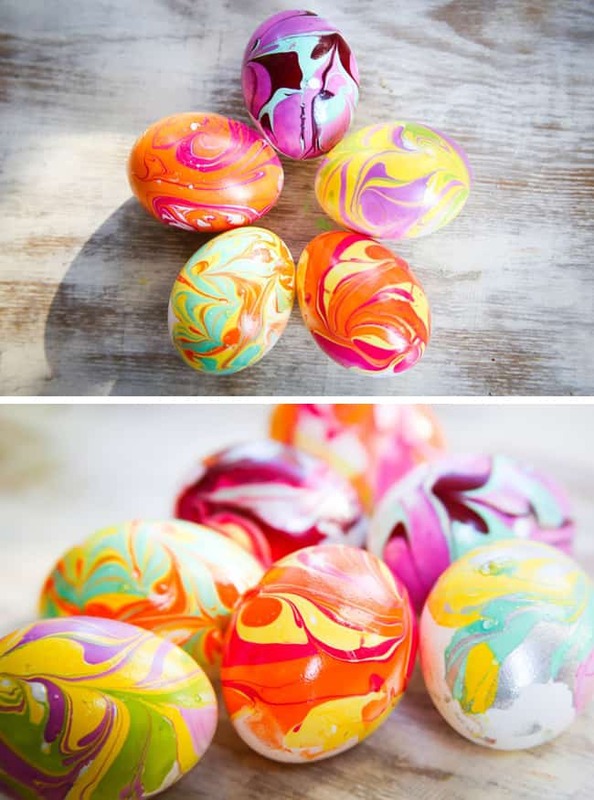 These are SO pretty – makes me want to color eggs! Haha! Sounds good but I’m not sure a hollow egg would sink in the water? Did you try it yet? Maybe you could roll it around on the top? Also, we use paint and a cheap tin (pie tin, roasting tin etc. from Dollar Tree) same thing and no messy fingers – just put a piece of poster board in the bottom and squirt lines of paint on it then put in the egg (one at a time) and roll it around until it’s covered the way you want it – you will also get a pretty cool looking piece of poster board to use some other crafty way!! Happy Crafting!! I’m over the top crushing on this. LOVE the vibrant colors! Is it safe to eat the eggs afterwards? I personally wouldn’t eat hard boiled eggs that have been colored with anything other than a food grade dye. These are AMAZING!! I’ve been dying to try this marbling technique. I love these colors! 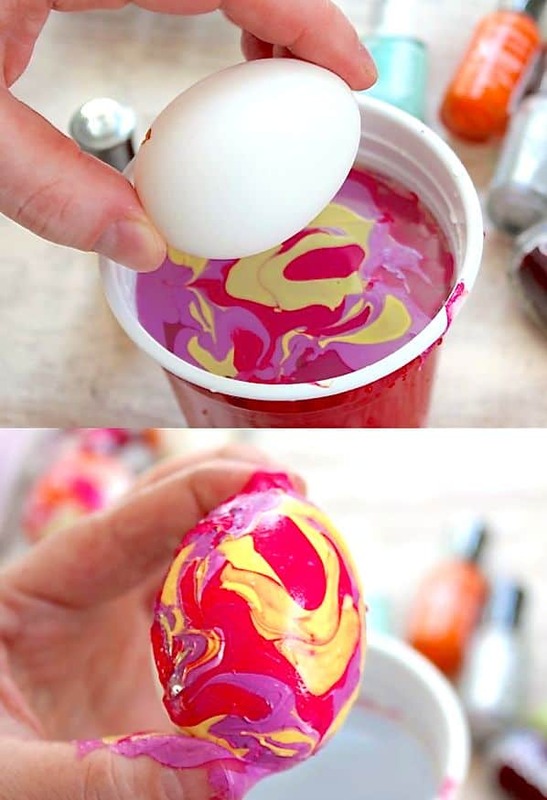 I remember trying a marbling kit one Easter when I was a kid and those eggs did NOT turn out well. Who knew the secret was nail polish?! These are so pretty! Wow! This are gorgeous! I’m so used to seeing marbling applications in pastels. These are really striking. Very well done! What beautiful colors! So perfect for Easter. This is so cool- I would never think to do this!